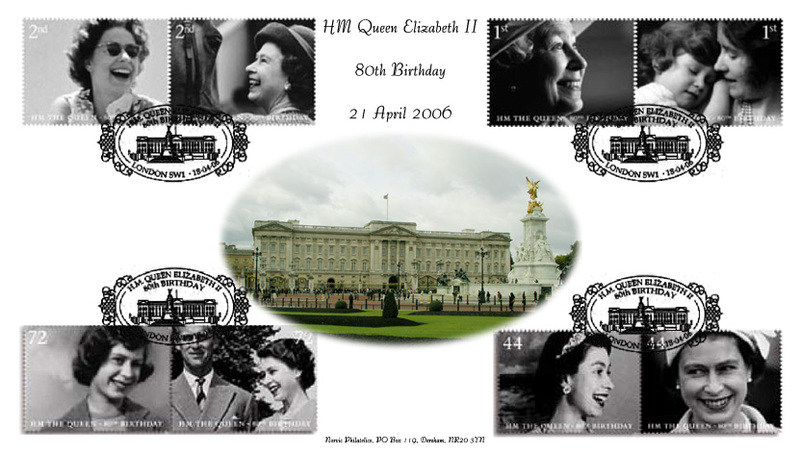 80th Birthday of HM Queen Elizabeth II - Great Britain stamps - 18 April 2006 - from Norvic Philatelics. To mark the Queen’s 80th birthday on 21 April, Royal Mail will issue eight warm and informal photographic portraits taken throughout her life. 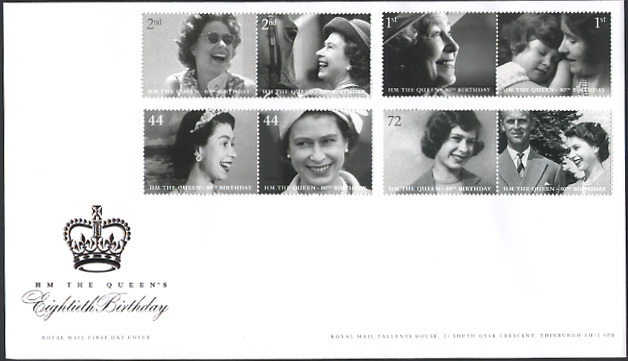 The eight stamps show Her Majesty from every decade except the decade of her birth and the 90’s. Pictures of Her Majesty in her early years were a bit thin on the ground especially as the brief dictated that she would need to be laughing or smiling. In the case of the 90’s, no picture was selected because despite sifting through many pictures from that decade, Roger Tooth was unable to find a suitable ‘cheerful’ shot which worked well with the set. This was possibly due, in part, to the fact that that particular decade was not exactly a great time for Her Majesty, and included her ‘annus horribilis’. Note the values on the left-hand 2nd class and left-hand 72p stamps are grey as shown on the Royal Mail fdc below, not white as shown on these publicity photos. Designed by Sedley Place, the stamps will be printed in gravure by Joh Enschede Security Print, size 41x30mm. Images are Copyright 2005/6 by Royal Mail. We have a selection of exclusive FDCs for this issue. The Buckingham Palace cover is postmarked with either L10029 or L10020 as shown. Price £8.95. These images are digital mock-ups so the postmarks may not be this size. Set of 8 stamps mint or very fine used - £4.50. PO stamp cards also available - these are postcard-sized reproductions of the stamps: price £3.25 set of 8. Any postmark (either date) on plain white c6 envelope with stamp of your choice - Price £1 plus cost of stamp, discounts available. Double-dated covers may also be produced - please ask if you would like these. 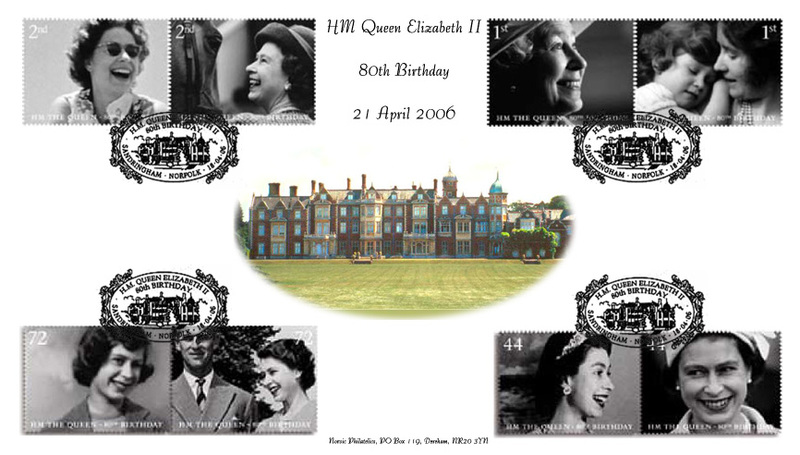 The special postmarks available on the Day of Issue and The Queen's actual birthday are shown here. NB: not shown to scale. These postmarks are for Her Majesty's Birthday on 21 April and can be applied to any of the stamps on any cover or card. If you have any questions regarding the products on this page email us.